A cropped version of Tim Coolbaugh’s dog rescue illustration for the 2016 poster series. Our annual call for haiku is in full swing until the deadline of Sept. 4. The 2016 poster series will consist of 15 posters created the traditional way (haiku first, illustration second) and one special poster created in reverse (image first, haiku second). For the special poster, artist Tim Coolbaugh illustrated a dog rescue scene. 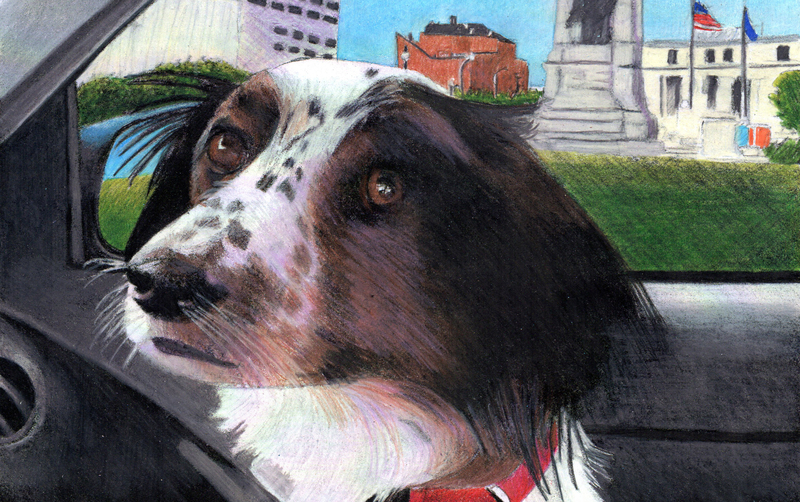 At first glance, it’s a simple image of a dog in the passenger seat of a car, as seen from the driver’s perspective, with Clinton Square in the background. The back story is more elaborate. Coolbaugh graduated from the Syracuse University with a master’s degree in illustration and has overseen the illustration program’s symposium. He is also a dog-lover, has owned several rescue dogs, and volunteers as a driver for dog rescue services. He has been helping to transport dogs from kill shelters to places that will find them homes since 2002. He estimates he has helped 2,300 dogs and cats, but mostly dogs. In Coolbaugh’s typical scenario, dogs are traveling from the south, where kill shelters are prevalent, to destinations in Canada or New England. Each week as many as 12 transports may travel through Syracuse. Coolbaugh participates in a network of 30 to 40 volunteer drivers. The transports usually take two days, with each driver driving 75 to 100 miles for a rendezvous. Coolbaugh drives on Sundays, and may make two or three runs in a given day. “What I get out of this is knowing that the animal is safe and is going to have a life,” he said. The dog that shares its life with Coolbaugh is Velvet, a seven-year old black Lab. To submit haiku to complement Coolbaugh’s illustration, or haiku for the traditional call for haiku, visit our website.